• and to make this manual available for other Schools for Life or other projects that are interested in the School for Life model. The envisaged development of the School for Life model, including kindergarten, primary school and junior high school may need up to 5 years. Another 5 years will be needed for the development of a senior high school and a higher education study program “social entrepreneurship” (B.A. and M.A.) to be prepared at the Ubon Ratchathanee University in Thailand. Within this period of time, i.e. within the next ten years, the Schools for Life are supposed to become more and more self-sustainable through income generation by their entrepeneurial units and through the marketing of a School for Life franchising system. • starting up first commercial units in the field of sensitive tourism and youth camp. • the organization of other spin-offs in order to further secure the economic existence of the School for Life. Children, when they are not hindered, actively steer their own learning processes. They are curious, motivated, learn through trial and error; they prefer a connection between “theory” and “practice” and opportunities for “learning by doing”. The children’s farm can act as a base station for discovery voyages á là Jules Verne. Gaining knowledge, skills and abilities serves the continuation of the children’s projects. The pedagogues no longer function as lion tamers who try to get the entire class to jump through a hoop, they act more as stimulators, developmental advisors, and assistants in the research and discovery voyages. Thailand’s National Education Commission has ideas for vocational training schools that are significantly further developed than the current international discussion regarding education. The vocational schools should be developed into “entrepreneurial schools”, and the graduates will be equipped with double qualifications: The ability, as an employee, to work as part of a team, yet possessing skills as an “innovative entrepreneur” to create jobs. The pilot study “The Development of Entrepreneurial Schools in Thailand” (Zimmer/Puntasen/Suksirikul/ Wawsri 2001) shapes the project planned for the future. The goal: Educate pupils to develop their entrepreneurial spirit. An innovative entrepreneur is a person without particular resources who plays with an entrepreneurial idea and carries it out on the marketplace. His best capital is a good idea that contributes to an improvement in the quality of living. This unique entrepreneur acts socially and ecologically responsibly and is successful without plundering resources. The résumés of people who have taken the plunge into running their own businesses have some characteristics in common: They were already developing entrepreneurial initiatives during their childhood, and they usually had difficulties with conventional schools. The project School for Life, the children’s farm, wants to create a setting that encourages children and youth to develop and attempt entrepreneurial ideas in a playful setting and without the pressure of starting a business. In this manner, children and youth prepare themselves for situations later in which it will be important to create employment positions for themselves and for others (instead of chasing after positions that are not available) to enable them to break through the circle of poverty. Entrepreneurship education does not mean encouraging children and youth to jump head first into a rapidly spinning consumer spiral, it means educating children and youth in intelligent humility with the goal of attaining a higher quality of life while using fewer resources. Community education means “learning in, with and for the community”. Learning is considered participation in lasting developments in the community. Community schools open themselves from the inside and the outside and participate in developing and shaping the community. 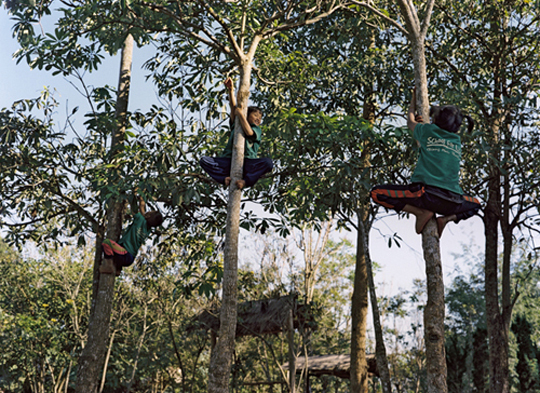 The School for Life and the village of Pongkum create a network that serves such developments on a small scale. Examples of this include: The farm creates jobs for people in the village and teaches them competencies in the area of organic farming. Guests helped the village school develop a recycling centre, where garbage from the village can be recycled; the children became managers and experts in recycling. The school often fed the orphaned children through charity rallies, which have been partially planned by the children, guests could improve the methods applied with which the children are cared for.